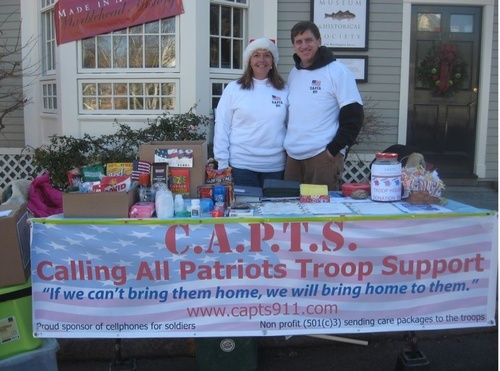 The Brings Family of Marblehead, MA started sending care packages to their towns deployed in 2006. We started with about 4 names and sent these packages to say “thank you for your service” and to let them know that they are not forgotten. As word spread of what we were doing, we had to start having collections for items that were needed and/or wanted by the soldiers due to the fact that we now had over 50 recipients on our list.C.A.P.T.S. (Calling All Patriots Troop Support) was founded for this reason. We are a Non-Profit organization (501(c)3) that sends care packages to our service men and women who are actively deployed overseas. Our goal is to make our packages personal and have that special feeling of “home”. Our boxes contain food products, undergarments, personal care items, books, magazines and other comforts from home. We try to make these boxes to have a personal connection to someone back home. C.A.P.T.S. coordinates all its efforts with local schools, VFW’s, working families and other organizations to involve the community in informing them about the needs of our US military personnel.